Special Day Resources: Veteran's Day / Remembrance Day. "The Way of Giving and Receiving," Kathryn Matthews, Sermon Seeds, 2018. "Pretentious Pretenders Pressuring Penurious Pensioners," D Mark Davis, raw translation and exegesis/questions, Left Behind and Loving It, 2012. Points for Preaching and Teaching, The Lectionary Lab, Proper 27B, the Rev'ds Dr. John Fairless and Delmer Chilton (aka "Two Bubbas and a Bible"), 2012. Girardian Reflections on the Lectionary, Proper 27, by Paul Nuechterlein & Friends. Rumors, for November 8, 2009, Ralph Milton, "Sermon helps for preachers with a sense of humor." Jesus Now, Proper 27B. Lectionary, study and worship resources from Faith Futures Jesus Then & Now. "The Widow's Might," Karoline Lewis, Dear Working Preacher, 2018. Living by the Word, Brad Roth, The Christian Century, 2018. "All My Mites," commentary and discussion, RevGalBlogPals, 2018. 11th Hour Preacher Party. "The Caravan as Spiritual Moment," Melissa Bane Sevier, Contemplative Viewfinder, 2018. "Heaven's Head Table," Michael Ruffin, Connections, 2018. Monday Meditation, Gary Neal Hanson, 2018. "The Widow's All: Revisited and Revised," Janet H Hunt, Dancing with the Word, 2018. "That It May be Well with You," Bob Cornwell, Ponderings on a Faith Journey, 2018. "Widows of the World," sermon-stories.com, 2018. "To Love and to Disagree," Amy Lindeman Allen, Political Theology, 2018. "Choices of God," poetry by Andrew King, 2018. This Week at PreachingIllustrations.com, 2018. "Surprisingly Good News," David Lose, ...in the Meantime, 2015. "The Widowed Prophet," Debie Thomas, Journey with Jesus, 2015. "Whole Life Living," Karoline Lewis, Dear Working Preacher, 2015. "Fully a Woman's Tale," John C. Holbert, Opening the Old Testament, 2015. "True Stewardship," Bob Cornwall, Ponderings on a Faith Journey, 2015. "The Abundant Life," Sharron R. Blezard, Stewardship of Life, 2015. "Illlusions of scribes & widows," Peter Lockhart, a different heresy, 2015. "Widows and Gifts," Eric Smith, LECTIO, 2015. "The Politics of the Widows' Gifts," Political Theology Today, 2015. "A Widow's Shame and Ours," Debra Dean Murphy, Ekklesia Project, 2015. "Peace on Justice," Barbara Born, 2015. "Seeing the Widow," Janet H. Hunt, Dancing with the Word, 2015. "Priceless or Worthless," Glenn Monson, Law and Gospel Everywhere, 2015. "America's Presidential Election and the 'Public Face of God's Purpose'," Dan Clendenin, The Journey with Jesus, 2012. 2009. 2006. "Rethinking Stewardship," David Lose, Working Preacher, 2012. "All In!" Alyce M. McKenzie, Edgy Exegesis, 2012. "When Less Is More," Sharron R. Blezard, Stewardship of Life, 2012. "What More Can We Say?" John C. Holbert, Opening the Old Testament, 2012. "The Lord Upholds the Orphan and the Widow," Danny Yencich, Ekklesia Project, 2012. "Final Offerings," Robert Cornwall, Ponderings on a Faith Journey, 2012. "The Widow's All," the Rev. Dr. Janet H. Hunt, Dancing with the Word, 2012. "She Gave Her All," Neil Chappell, a weird thing, 2012. "Devouring Widows Houses," Peter Lockhart, A Different Heresy, 2012. A Sermon for Every Sunday, Lisa Cressman, 2018. "Ruth," Frederick Buechner Sermon Illustrations. "What God Values in Stewardship," the Rev. Dr. D. Scott Weimer, Day 1, 2009. "The Way of Giving and Receiving" Weekly Seeds, UCC, 2018. Worship Resources, Rev. Mindi, Rev-o-lution, 2018. Mustard Seeds, "What Is Really Important?" Proper 27, 2012. A lectionary-based ideas resource for leaders of contemporary worship, Ann Scull, Gippsland, Australia. Worship and Liturgy Resources, Ordinary 32, by Rev David Beswick, Uniting Church in Australia. Lector's Notes, Ordinary 32, Gregory Warnusz, Saint Jerome Parish, Bellefontaine Neighbors, MO. Notes and commentary for those reading this week's lectionary texts to the congregation. "Liturgy: prayers reflection," reflections on the collect at the Eucharist, NZPB, (TEC BCP USA) (3rd before Advent, C of E) Rev. Bosco Peters, New Zealand. The Timeless Psalms: Psalm 127, Joan Stott, prayers and meditations based on lectionary Psalms, 2015. Prayers of the People, Blessing/Benediction, Lowell Grisham, St. Paul's Episcopal Church, Fayetteville, Arkansas, 2018. HermanoLeón Clipart, Ordinary 32. Free clipart, backgrounds, slides, etc. 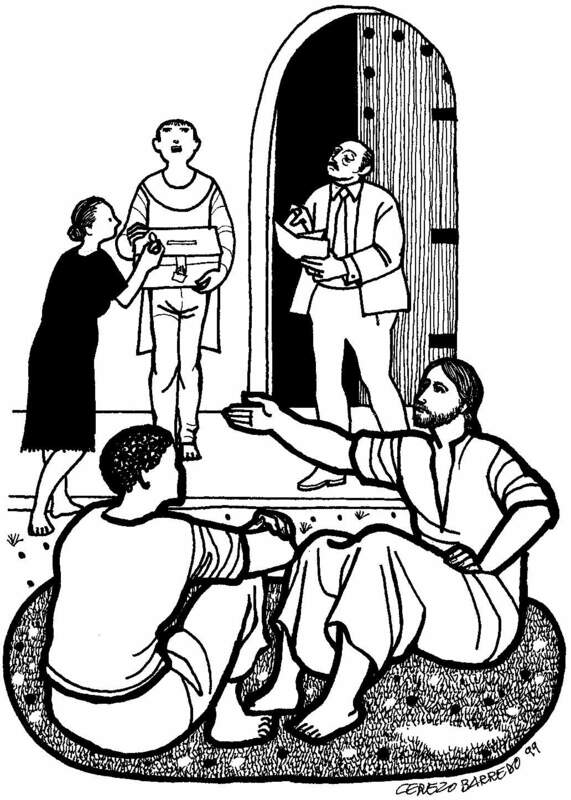 Clip Art Images: Mark 12:38-44, Misioneros Del Sagrado Corazón en el Perú. Ordinary 32 at Cerezo Barredo's weekly gospel illustration. Follows Latin American Roman Catholic gospel reading, though most gospels texts/themes are found in the index. Liberation emphasis. "The Power of Chump Change," Greg Carey, ON Scripture, Odyssey Networks, 2012.Video: The Progressive Budget: A Duty to the Poor. “Jesus Sat and Watched the Crowd,” Carolyn Winfrey Gillette, is a hymn inspired by Jesus teaching about the widow in the Temple, Tune: HENDON 7.7.7.7.7 (“Take My Life and Let It Be”). Psalm 127 set to Old 100th (LM), Psalm 146 set to St Thomas (SM 66 86), by Dale A. Schoening, Metrical Psalms. Hymn and Song Suggestions, Proper 27B, 2015, annotated suggestions from Natalie Sims, Singing from the Lectionary. Lectionary Hymns, Ordinary 32B, National Association of Pastoral Musicians. Choral Anthem Project, Ordinary 32B, National Association of Pastoral Musicians. "The Spirit of Giving," Dianne Deming, Children's Sermons Today, 2012. 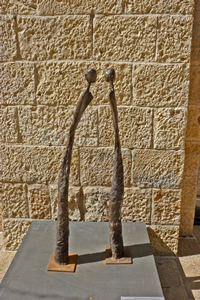 "Holding Hands," Frances Woodruff, On the Chancel Steps, 2012.